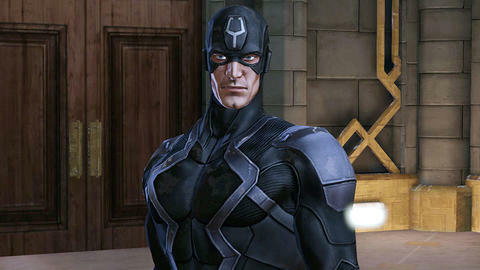 The silent king of the Inhumans makes his voice heard in Marvel’s MMO! Have you ever wondered what it would feel like to unleash Black Bolt’s sonic assault on a host of baddies up to no good? Look no further than “Marvel Heroes 2016” where players can harness the Inhuman king’s incredible voice and exceptional martial prowess to dismantle any foe crazy enough to stand in his way. We talked to Gazillion Lead Game Designer Benjamin Gilbert to get a breakdown of Black Bolt’s abilities and figure out just what makes Blackagar Boltagon—real name—tick. Marvel.com: Let’s talk Black Bolt! I’ve always had a soft spot for Blackagar and I’m super excited to see him showing up in the game. What does this powerful Inhuman bring to the game that no other character does? Benjamin Gilbert: Black Bolt is a unique blend of a ranged energy blaster and a mobile scrapper with a spectacular splash of blue crackling visuals fit for a king. Marvel.com: Black Bolt has a very iconic look, a lot of black and blue with a touch of silver. For his “Marvel Heroes 2016” costume was there a specific artist/storyline the team pulled from? Benjamin Gilbert: His “All-New All Different” look was pulled from UNCANNY INHUMANS directly. The Classic look was less about a specific story and more about taking the general details that make it “classic” and seeing if there was anything we could do to modernize it a bit but not lose the original appearance. Marvel.com: Can you tell us a little about Black Bolt’s ability trees? How are we playing the King of the Inhumans? Benjamin Gilbert: All his powers center around his primary resource mechanic called “Energy.” His first tree, “Scion of Attilan,” features all his Melee-centric powers, and also some that feature him zipping around with his cool wings. Next is “Inhuman Conduit,” which features him channeling particles into destructive beams or crashing waves of force that wash away enemies at range. His Talents will let you tailor Black Bolt’s kit to your play-style: all brawling? All range? A bit of both? You decide! Marvel.com: What are some of the team’s favorite Black Bolt builds? Benjamin Gilbert: My personal favorite is his melee build, using the Master Blow talent to swap out his Signature for a heavy-hitting melee one. [Others prefer] his ranged build, blasting enemies to smithereens from afar, occasionally using the slightest whisper to annihilate entire groups. Marvel.com: What abilities are you most excited for players to try out? Benjamin Gilbert: His Ultimate ability “Royal Decree” is quite a thing to behold. He unleashes the full potential of his voice in a reality-rending yell that instantly vaporizes non-boss enemies and decimates everything else. Marvel.com: Anything else we need to know? Benjamin Gilbert: The Attilan King is a great choice for beginners to “Marvel Heroes” and veterans alike. His kit can be molded to any play style and has enough stopping power to take on any challenge, and in stunning visual style to boot!